It’s been awhile since I’ve used this terminology. But global markets this week recalled the old “Bubble in Search of a Pin.” It’s too early of course to call an end to the great global financial Bubble. But suddenly, right when everything looked so wonderful, there are indication of "Money" on the Move. And the issue appears to go beyond delays in implementing U.S. corporate tax cuts. The S&P500 declined only 0.2%, ending eight consecutive weekly gains. But the more dramatic moves were elsewhere. Big European equities rallies reversed abruptly. Germany’s DAX index traded up to an all-time high 13,526 in early Tuesday trading before reversing course and sinking 2.9% to end the week at 13,127. France’s CAC40 index opened Tuesday at the high since January 2008, only to reverse and close the week down 2.5%. Italy’s MIB Index traded as high as 23,133 Tuesday before sinking 2.5% to end the week at 22,561. Similarly, Spain’s IBEX index rose to 10,376 and then dropped 2.7% to close Friday’s session at 10,093. Having risen better than 20% since early September, Japanese equities have been in speculative blow-off mode. After trading to a 26-year high of 23,382 inter-day on Thursday, Japan’s Nikkei 225 index sank as much as 859 points, or 3.6%, in afternoon trading. The dollar/yen rose to an eight-month high 114.73 Monday and then ended the week lower at 113.53. From Tokyo to New York, banks were hammered this week. Perhaps the more important developments of the week unfolded in fixed-income. Despite the selloff in the region’s equities markets, European sovereign debt experienced no safe haven bid. German bund yields traded at 0.31% on Wednesday, before a backup in rates saw yields close the week at 0.41%. Italian bond yields traded as low as 1.69% on Wednesday before closing the week at 1.84%. Spain’s yields ended the week up 10 bps to 1.56%. NRG’s large refinancing was the first junk deal pulled since June. Friday saw Canyon Consolidated Resources cancel its junk bond sale. Interestingly, Tesla’s $1.8 billion junk bond issue sold back in August now trades near 94, with yields up 50 bps in two weeks to 6.26%. Netflix’s 2018 bond saw yields jump 27 bps this week to 5.18%. This week’s junk selloff was most pronounced in the telecom and healthcare sectors, buffeted by earnings disappointments and the failed Sprint/T-Mobile merger. Sprint CDS surged 120 bps this week to an 11-month high 342 bps. It’s worth noting that telecommunications sector – making up about 20% of most junk indices – has suffered a flurry of earnings disappointments this quarter. CenturyLink (2039) bond yields surged 42 bps this week to 9.46%. There were notable jumps in (high-yield) communication-related company CDS prices this week. CDS prices spiked 542 bps for Windstream, 223 bps for Frontier Communications, 175 bps for CenturyLink, 163 bps for Qwest, 88 bps for Level 3 Communications and 25 bps for Dish Corp. In the investment-grade communications arena, CBS, Viacom, Expedia and Bell South all saw CDS prices rise to near six-month highs. Monitoring U.S. junk spreads by sector, Tech, Consumer Discretionary, Telecommunications and Healthcare all traded to three-month wides this week. One could argue that the strong performance of Energy over recent months has helped mask deteriorating performance in key high-yield sectors. Especially late in Bubble periods, the marginal (“junk”) borrower plays an instrumental role in both Financial and Real Economy booms. Loose financial conditions and intense speculation ensure abundant cheap finance. And so long as cheap “money” remains readily available, it will be borrowed (irrespective of the trend in fundamental factors). A tech-heavy Nasdaq surged to record highs during the first quarter of 2000, seemingly oblivious to the rout that was unfolding in telecom debt. In all the exuberance, it’s easy to forget that “tech” Bubbles are fueled by infrastructure spending by scores of negative cash flow enterprises dependent on junk bonds, leveraged lending, speculative sector flows and loose finance more generally. Especially after securities prices have succumbed to speculative blow-off dynamics, few are prepared for how rapidly liquidity abundance can disappear. Over the past year, enormous worldwide issuance of high-yield debt has been integral to the global Bubble. From Bloomberg Intelligence: “Emerging market primary market activity remains red-hot, with benchmark-eligible hard-currency debt issuance surpassing $500 billion this year for the first time on record.” China is currently enveloped in a (higher yielding) corporate debt issuance boom. Europe has been enjoying a spectacular boom, with junk yields sinking all the way to a ridiculous 2%. At this point, junk bond weakness is relatively confined. And in the recent past we’ve witnessed pullbacks that refreshed. Speculators were emboldened, as financial conditions loosened only further. Yet could sector concerns prove a harbinger of asset class issues and a problematic Risk Off backdrop? When markets turn highly speculative – and especially when in “melt-up mode” – underlying fundamentals are not all that relevant to securities prices. News and analysis will invariably focus on the positive, while surging markets create their own liquidity and self-reinforcing bullish psychology (“greed”). It’s also true that markets can enjoy speculative blow-offs even in the face of underlying fundamental deterioration. The years 1999 and 2007 are not yet ancient history. I’m beginning to think it might not take all that much to wake folks us to risk. And by the looks of Japanese and European equities (along with junk ETFs) this week, there may be some big players with fingers hovering over sell buttons. The Fed will likely raise rates next month, and I’ve already read some analysis that chairman Powell may not be the dovish pushover he’s been portrayed. There was also news out this week shedding further light on the growing split at the ECB. And the esteemed head of the People Bank of China was publicly warning of ‘hidden, complex, sudden, contagious and hazardous’ risks in the Chinese financial system. 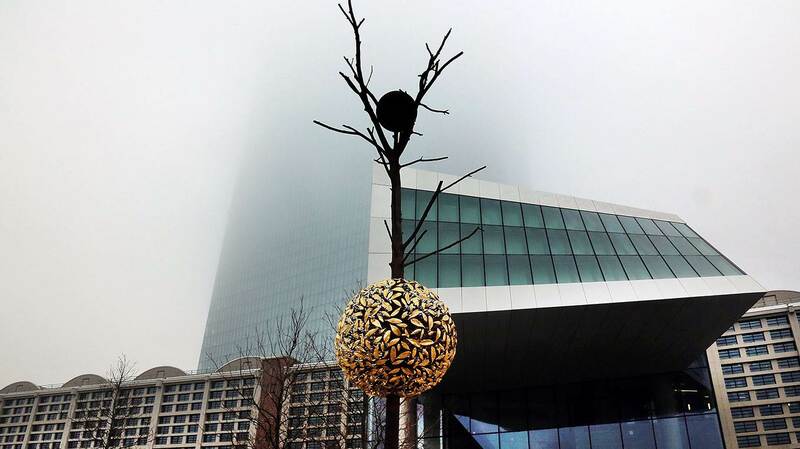 Recent highflyer EM equities markets fell under some pressure. Stocks were down 2.4% in Brazil and 2.1% in Turkey. Stocks retreated about 1% in India and Mexico. Geopolitical issues hammered markets in the Middle East. In general, Latin American equities were under notable selling pressure. There was also upward pressure on local currency EM bond markets. Yields were up 65 bps in Lebanon, 55 bps in Argentina and 19 bps in Brazil. Many EM yields traded to six-month highs this week. Most dollar-denominated EM yields moved to three-month highs. From Bloomberg: “Mysterious Gold Trades of 4 Million Ounces Spur Price Plunge.” I haven’t a clue who might want to dump gold. But it was a week that saw losses in stocks, Treasuries, corporate debt and bullion. I would venture that it was not a particularly good performance week for the so-called “risk parity” crowd. Few groups have benefitted more from the float-all-boats, massive monetary stimulus of the past (going on) nine years. There are scores of investment models that have worked brilliantly during the most prolonged of bull markets. A tightening of financial conditions would expose a lot of genius swimming naked. So how might we get from the recent “Risk On” to a problematic “Risk Off”? Imagine a flurry of outflows from junk ETFs spurring illiquidity in the underlying securities holdings. This begins to spook some players leveraged in investment-grade corporate Credit. The more sophisticated players begin to take some risk off the table, as financial conditions tighten. Fears of outflows from the - now massive - passive investment-grade funds complex spur incipient risk aversion in equities. De-risking/de-leveraging dynamics begin to take hold – at home and abroad (spike in the yen pressuring global “carry”?). And with everyone now Crowded so nice and tight into the big tech names, an abrupt reversal of the leadership technology stocks would further rattle the leveraged lending market that has been operating in overdrive. Fears of a bursting “tech” Bubble overwhelm greed. Sinking tech would take down the indices, unleashing a bit of harsh reality upon the tsunami of “money” that has disregarded risk to participate in the passive index mania. The short volatility Crowd gets crushed. Whether you like it or not, history is on our side. We will bury you!” Thus in 1956 did Nikita Khrushchev, then first secretary of the Communist party of the Soviet Union, predict the future. Xi Jinping is far more cautious. But his claims, too, are bold. “Socialism with Chinese characteristics has crossed the threshold into a new era,” the general secretary of the Communist party of China told its 19th National Congress last week. “It offers a new option for other countries and nations who want to speed up their development while preserving their independence.” The Leninist political system is not on the ash heap of history. It is, yet again, a model. Yet how has the system that failed in Moscow succeeded in Beijing? The big difference between the two outcomes lay with Deng Xiaoping’s brilliant choices. China’s paramount leader after Mao Zedong kept the Leninist political system — above all, the dominant role of the Communist party — while freeing the economy. His determination to maintain party control was made clear by his decisions during what the Chinese call the “June 4 Incident” and westerners the “Tiananmen Square massacre” of 1989. Yet his resolve to continue with economic reform never faltered. The results were spectacular. Whether the Soviet Union could have followed such a path is open to debate. But it did not. As a result, today’s Russia does not know how to mark the October revolution of a century ago: President Vladimir Putin is an autocrat, but the communist system has gone. Mr Xi is also an autocrat. His dominance over party and country was on display at the party congress. But he is also an heir to the Leninist tradition. His legitimacy rests on the party’s. What are the implications of China’s marriage of Leninism and market. China has indeed learnt from the west in economics. But it rejects modern western politics. Under Mr Xi, China is increasingly autocratic and illiberal. In the Communist party, China has an ostensibly modern template for its ancient system of imperial sovereignty and meritocratic bureaucracy. But the party is now emperor. So, whoever controls the party controls all. One should add that shifts in an autocratic direction have occurred elsewhere, not least in Russia. Those who thought the fall of the USSR heralded the durable triumph of liberal democracy were wrong. Will this combination of Leninist politics with market economics go on working as China develops? The answer must be: we do not know. A positive response could be that this system not only fits with Chinese traditions, but the bureaucrats are also exceptionally capable. The system has worked spectacularly so far. Yet there are also negative responses. One is that the party is always above the law. That makes power ultimately lawless. Another is that the corruption Mr Xi has been attacking is inherent in a system lacking checks from below. Another is that, in the long run, this reality will sap economic dynamism. Yet another is that as the economy and the level of education advances, the desire for a say in politics will become overwhelming. In the long run, the rule of one man over the party and that of one party over China will not stand. All this is for the long run. The immediate position is quite clear. China is emerging as an economic superpower under a Leninist autocracy, controlled by one man. The rest of the world has no choice but to co-operate peacefully with this rising power. Together, we must care for our planet, preserve peace, promote development and maintain economic stability. At the same time, those of us who believe in liberal democracy — the enduring value of the rule of law, individual liberty and the rights of all to participate in public life — need to recognise that China not only is, but sees itself, as a significant ideological rival. The challenge occurs on two fronts. First, the west has to keep a margin of technological and economic superiority, without developing an unduly adversarial relationship with Mr Xi’s China. China is our partner. It is not our friend. Second and far more important, the west (fragile as it is today) has to recognise — and learn from — the fact that management of its economy and politics has been unsatisfactory for years, if not decades. The west let its financial system run aground in a huge financial crisis. It has persistently under-invested in its future. In important cases, notably the US, it has allowed a yawning gulf to emerge between economic winners and the losers. Not least, it has let lies and hatred consume its politics. Mr Xi talks of the “great rejuvenation of the Chinese nation”. The west needs rejuvenation, too. It cannot rejuvenate by copying the drift towards autocracy of far too much of today’s world. It must not abandon its core values, but make them live, once again. It must create more inclusive and dynamic economies, revitalise its politics and re-establish anew the fragile balance between the national and the global, the democratic and the technocratic that is essential to the health of sophisticated democracies. Autocracy is the age-old human norm. It must not have the last word. CAMBRIDGE – Europe faces a serious problem. Although economic activity has recently increased, the eurozone has lost the ability to respond to the next downturn when it happens, as it inevitably will. •a change of monetary policy. But Draghi went on to predict that Germany would not create a fiscal deficit and that Italy and France would not undertake the needed structural reforms. He concluded that the ECB would have to stimulate growth by reducing interest rates, which would increase net exports by creating a more competitive euro. The ECB has since taken the short-term interest rate into negative territory, cutting it from 0.2% in August 2014 to -0.3% now. The ECB also bought long-term bonds for its portfolio, increasing the volume of its holdings from €2.2 trillion ($2.6 trillion) in 2014 to more than double that amount now. The euro-dollar exchange rate fell from $1.39 in 2014 to a low of $1.04 in 2016, before recovering to the current level of $1.18. The ECB’s negative-interest-rate policy also stimulated business investment and other spending that is sensitive to borrowing costs. But the ECB’s policies also mean that it has no ammunition left to fight the next recession, which could be caused by a collapse of asset prices, starting with the price of long-term bonds. German ten-year bond prices are extremely high, reflecting a current yield of less than 0.5%. A fall in US stock and bond prices, which are also out of line with past experience, could cause European asset prices to decline in sympathy. Alternatively, European exports could fall in response to geopolitical events in Asia or the Middle East, depressing overall economic activity in Europe. An end to the US expansion, now in its ninth year, could pull down demand in Europe. Although the US economy is now performing very well, the excessive level of asset prices – the result of a decade of near-zero interest rates – poses a threat to stability. Whatever the cause of the next downturn, ECB policies that helped in the past would no longer be available. The conventional response – reducing interest rates – is impossible, because current short-term interest rates in the eurozone countries are already near zero or negative. To be sure, the ECB could expand its purchases of long-term bonds. But doing so would not have the same effect that it did in the past. One of the goals of large-scale bond purchases – so-called quantitative easing – was to drive down long-term interest rates in order to stimulate business investment and housing construction. But with long-term interest rates now close to zero, bond purchases would not be able to lower them any further. Another goal of lowering the yield on long-term bonds was to stimulate demand for equities. Higher stock prices would lower the cost of equity-financed business investment and increase household wealth, thereby stimulating consumption. This was never as successful in Europe as it was in the United States, where share ownership is more widespread. But now, with long-term bond yields already close to zero, it could not even be tried. In short, the ECB would be unable to respond to an economic downturn by lowering interest rates and buying long-term bonds. And without the ability to reduce interest rates, the ECB also would be unable to stimulate net exports by reducing the value of the euro. Whereas the US could respond to a new downturn with fiscal stimulus, it is difficult to see how this could be achieved in Europe. The eurozone has no fiscal authority. Each member country could of course reduce taxes and increase spending. But much of the stimulus would spill over to the country’s trading partners through increased imports. The result would be an increase in the country’s national debt with relatively little increase in its domestic demand. An appropriate response to this dilemma may be a policy of coordinated fiscal expansion. Each country would have to agree to a combination of tax cuts and increases in government spending scaled to the size of the economic downturn. Waiting until the downturn occurs to plan this coordinated response would be a mistake. All eurozone governments should place fiscal coordination with their European partners high on their agenda, before it is too late. Bitcoin halted a two-day slump as speculators saw a 29 percent plunge from its record high as possibly an excessive response to a technology upgrade getting cancelled. The cryptocurrency was little changed at $6,593, as evidence emerged that bearish investors started to cover their short positions. The drop earlier was as much as 15 percent from Friday, when investors were prompted to switch into rival technologies. Bitcoin cash, an alternative that split from the original bitcoin in August, has jumped about 19 percent since Friday, according to data compiled by Coinmarketcap.com. “We have seen similar steep falls in Bitcoin throughout the year -- specifically in June and September -- but every time a considerable decline occurs, new investors jump in to experience the new asset class,” Hussein Sayed, chief market strategist at ForexTime Ltd., a currency broker that uses the brand FXTM, wrote in a note Monday. While markets had been focusing on bitcoin’s more than 500 percent surge this year, bitcoin cash was gaining popularity because of its larger block size. That’s a characteristic that makes transactions cheaper and faster than the original. When a faction of the cryptocurrency community canceled plans to increase bitcoin’s block size on Wednesday -- a move that would have created another offshoot -- some supporters of bigger blocks rallied around bitcoin cash. The resulting volatility has been extreme even by bitcoin’s wild standards and comes amid growing interest in cryptocurrencies among regulators, banks and fund managers. While skeptics have called its rapid advance a bubble, the asset has become too big for many on Wall Street to ignore. Even after shrinking as much as $38 billion since Wednesday, bitcoin boasts a market value of about $110 billion. Bitcoin’s earlier slump had dragged down shares of cryptocurrency-related companies, including Hong Kong-based PC Partner Group Ltd., maker of graphics cards that can be used in the mining of digital coins. But there were few signs of wider ripple effects. Asian stocks were mixed as investors awaited continuing talks on tax legislation in the U.S. this week. The cancellation of last week’s bitcoin upgrade has left users to choose between the two versions of the cryptocurrency. On one side is the original bitcoin, powered by so-called SegWit technology, which aims to improve its performance by moving unessential data off of its underlying blockchain. On the other side is bitcoin cash, which allows its blockchain to handle eight times as much data as the original. Proponents of bitcoin cash believe their approach is simpler and closer to the original goal of bitcoin, which was described primarily as a payment system in its white paper. Supporters of the original bitcoin say that vision is too limited, and that by improving the blockchain with SegWit technology, bitcoin can become a new digital-asset class that not only supports payments but countless other functions. While bitcoin cash has been around for months, it saw limited support as the community awaited last week’s technology upgrade for the original bitcoin, which promised similar features. Now that the upgrade has been called off, businesses that use the cryptocurrency primarily as a payment method are expected to increase adoption of bitcoin cash. While bitcoin cash surged over the weekend, it hasn’t been a straight line up. The cryptocurrency was trading at $1,130 at 12:40 a.m. in London, down from a high of about $2,478 on Sunday, Coinmarketcap.com prices show. Bitcoin has been similarly volatile; it initially rose after news that it would avoid another split, but the gains were short-lived. Its plunge earlier today compared with an intraday record $7,882 on Nov. 8. Volume across bitcoin exchanges jumped to 436,021 bitcoins on Sunday, the highest since September, Bitcoinity.org data show. BitMEX, an exchange for cryptocurrency derivatives that allows shorting, saw record activity on Sunday, Chief Executive Officer Arthur Hayes said. “Crypto trading is not for the novice investor,” said John Spallanzani, chief macro strategist at GFI Securities LLC in New York. When the Federal Reserve began raising interest rates, every bank was a winner. As the Fed prepares for its fifth rate boost, some banks are benefiting more than others. When rates start to rise, banks are typically in no rush to raise their deposit rates. After several increases, banks have to pay out more to depositors or risk seeing them leave in search of higher yields. We have hit that point now, but it is playing out in a surprising way, according to analysts at Keefe, Bruyette & Woods. So far this year, the average cost of interest-bearing deposits at big banks like Bank of America BAC -0.72%▲ and J.P. Morgan Chase has gone up by 0.18 percentage point, compared with a 0.10 increase at large regional lenders like SunTrust Banks , KBW calculates. 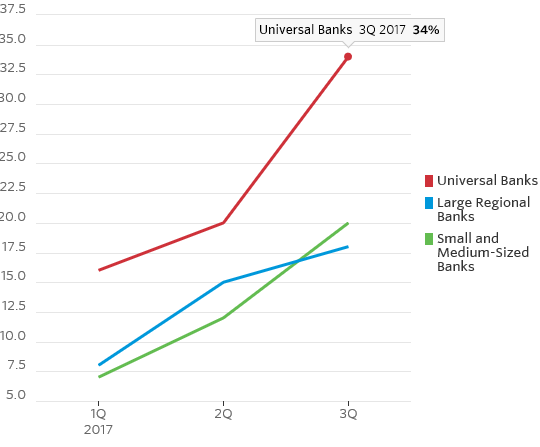 The so-called deposit beta, which measures how much banks raise their rates as a percentage of the Fed rate increase, reached 34% for universal banks in the third quarter, up from 16% in the first quarter. But large regional lenders and small banks have seen a more gentle response, with deposit betas hitting 18% and 20% respectively, in the third quarter. 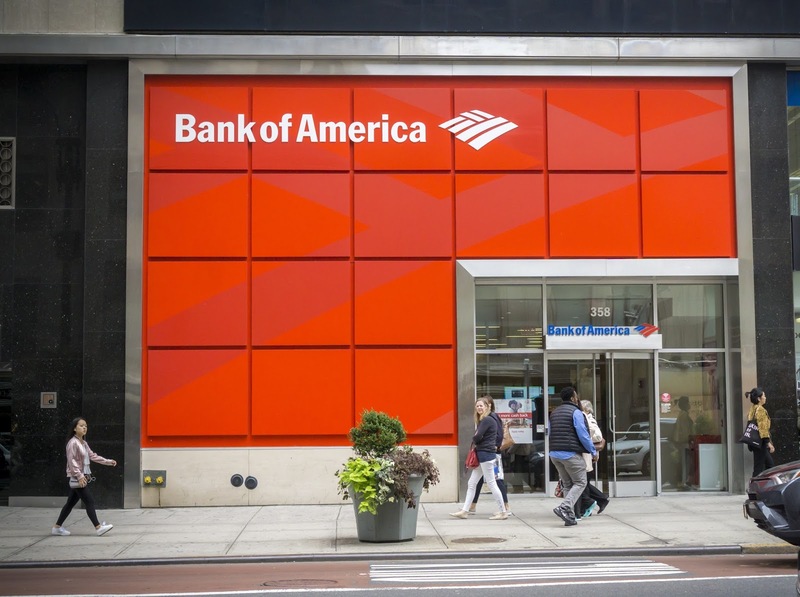 Ordinarily giants like Bank of America are slower to raise rates, thanks to their strong brand and market positions. The difference this time is these banks have been pushing to serve wealthier clients who are more likely to move money around in search of higher yields. KBW analyst Christopher McGratty says he expects smaller banks to catch up as awareness spreads among depositors that they can earn more. Smaller banks also are growing faster and have higher loan-to-deposit ratios, so their need for funding is greater. In a rising rate environment, differences in business models, regardless of size, become more important. Banks that focus on commercial and industrial loans tend to have more reliable deposit bases than banks that specialize in commercial real estate lending, Mr. McGratty says. That is because the companies that borrow from C&I lenders tend to keep deposit balances with the banks for working capital needs, while real estate borrowers put the money to work right away on new projects. New York Community Bank, for instance, which specializes in multifamily real estate lending, had a deposit beta of 36% in the third quarter, according to KBW, showing that it is paying up for deposits. Large regional C&I lender Comerica , by contrast, had a deposit beta of just 14%. Real-estate loans tend to be fixed-rate, while commercial and industrial loans have floating rates, making them more attractive when rates are rising. This helps explain why New York Community Bank shares are down 20% so far this year, while Comercia shares have risen 16%. Bank-deposit costs may get more in sync as rates keep going higher, but for now investors need to focus on the differences. EARLIER this year, Melih Gokcek, the veteran mayor of Ankara and a member of the ruling Justice and Development (AK) party, hosted a group of foreign journalists at an estate on the capital’s outskirts. Mr Gokcek began by clicking his way through a gruesome PowerPoint presentation on the previous summer’s failed coup, mixing images of bodies mangled by tanks with the soundtrack from the film “Requiem for a Dream”. He finished by claiming that Western powers had been involved in the bloodbath, that the Obama administration had created Islamic State, and that American and Israeli seismic vessels were deliberately setting off earthquakes near Turkey’s Aegean coast. A bewildered reporter asked where Mr Gokcek was getting his information. “I have the world’s best intelligence service at my disposal,” the mayor responded. “It’s called Google.” He did not seem to be joking. Mr Gokcek’s career as Turkey’s leading conspiracy theorist, a title fought over by many members of President Recep Tayyip Erdogan’s inner circle, came to an abrupt end on October 23rd, when the mayor announced he would resign after more than two decades in the job. (Many were baffled that he had held on to his office for so long.) His decision followed weeks of rising pressure by Mr Erdogan and pro-government newspapers, some of which suggested Mr Gokcek would face criminal charges if he refused to step down. The nature of those charges was not specified, but many readers got the hint. In 2015 a former deputy prime minister accused Mr Gokcek of large-scale corruption. He never produced the evidence he claimed to have gathered, and the mayor denied the allegations. Mr Gokcek’s is one of many heads to have rolled at municipalities across Turkey this autumn. Since September, six AK mayors whose terms would have expired in 2019 have stepped down. 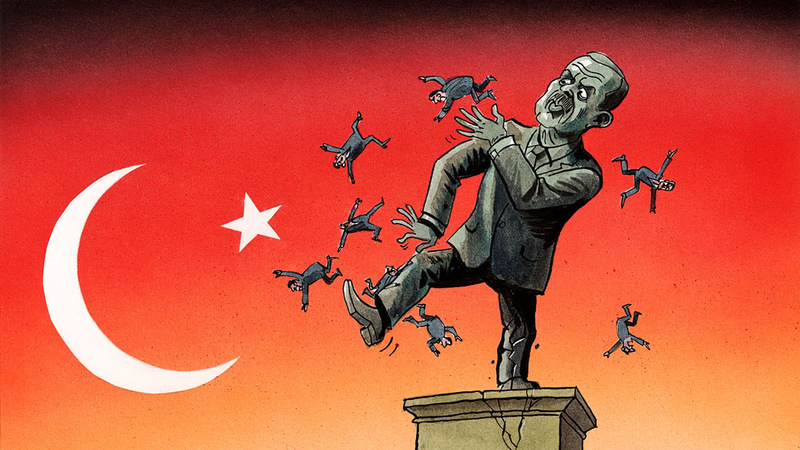 Mr Erdogan is said to have ordered the resignations, which began with the mayor of Istanbul. The fact that Mr Erdogan can casually defenestrate elected officials is further evidence of how authoritarian his government has become. Over the past year he has presided over the arrests of more than 80 mayors in the Kurdish south-east. Many have been replaced by government-appointed trustees. Inside AK itself, dissent has ceased to exist. There is less and less room for it elsewhere. The purges unleashed by Mr Erdogan since the coup have cost some 60,000 people their freedom and 150,000 their jobs. In a sign that more arrests may be coming, police detained Osman Kavala, a respected philanthropist, on October 18th, and Saban Kardas, a think-tank scholar, a couple of days later. The mood in the European Union is equally foul. At a summit this month, EU leaders discussed freezing the aid Turkey gets as part of its bid to accede to the bloc. On October 25th the European Parliament voted to cut it by up to €80m ($94m), citing the human-rights situation. The membership talks have reached a dead end. Under emergency rule, which was recently prolonged for three months, Mr Erdogan enjoys unchecked powers. But by turning the purge against his own party’s mayors he may have revealed a sense of anxiety about his future. Earlier this year a referendum on giving him more power barely passed despite the government’s efforts to stack the odds in his favour; in Ankara and Istanbul, the “no” vote prevailed. Senior AK officials defend the sackings by saying that the party must rejuvenate itself for the local, parliamentary and presidential elections in 2019. Polls show the number of “undecided” voters rising. “We need some changes and new faces,” says Yasin Aktay, a presidential adviser.